For most self-published authors, using Amazon’s publishing platform is the best choice. However, many authors don’t take full advantage of their digital marketing efforts to make the most of every impression on, and click from, potential readers. We have told you before about how GeoRiot’s Genius Link service makes the most of every click from anywhere in the world, on any device, and now, we’re presenting another tool for authors and publishers who are looking to optimize their marketing… the Amazon Associates program. Amazon Associates earn commission on sales within Amazon when they send traffic into Amazon’s stores to purchase items. So when you link to a book on Amazon, someone clicks your link, then buys that book (or any product), you get up to 8% of that sale yourself. This means that you can earn back up to 8% of anything sold in Amazon, even if it’s your own book! Whether you plan to be full time affiliate or you just want extra revenue from the promotions you already do for your book, leveraging the Associates program is a no-brainer. Signing up for the program is easy (and you can learn how to do that here), but there are a lot of moving parts within the greater Amazon Associates Ecosystem that allow you to maximize your return. 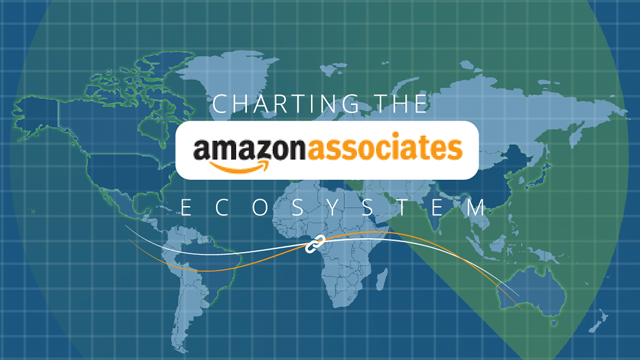 That’s why we condensed the best tools and resources for Amazon Associates into one “map” for you to keep on hand as you make the Amazon Associates program work for your marketing. An excellent post, thanks for sharing. I recently hosted myself a GeoRiot feature. The ability to combine global links with the affiliate network is astounding!